Streamline employee efficiency by granting desktop access anywhere, anytime. Pharmaceutical companies are facing a growing mountain of complicated rules and regulations. That makes data management an increasingly burdensome task. Today, pharmaceutical and biotech companies require advanced IT solutions that allow them to more efficiently collect, store, and share important clinical data. Thankfully, cloud desktops designed specifically for the healthcare industry can help businesses struggling to comply with complex and costly requirements. 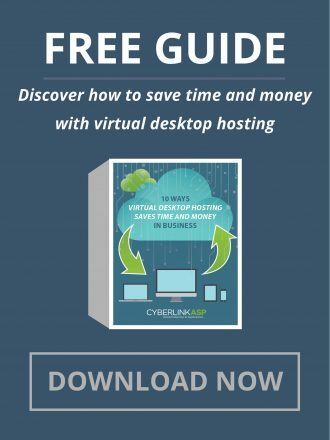 CyberlinkASP’s virtual desktops facilitate compliance, increase efficiency, and protect sensitive data from vulnerabilities. By streamlining the administrative process and providing easier access to real-time information, our cloud-based data management systems help firms prepare for the considerable changes brought about by a rapidly evolving industry. By offloading pharmaceutical management software to the cloud with CyberlinkASP, vendors can focus on core product development to remain competitive without wasting time and resources on software and hardware upgrades and maintenance. Our team understands the challenges that our pharmaceutical customers face, and have extensive experience with the software vendors that keep the industry moving. Sensitive data is maintained in a safe, secure environment with constant monitoring. We makes sure that your system and data are compliant so you don’t have to worry. We handle regularly scheduled backups to reduce your risk of data loss. If a catastrophic event occurs, rest easy knowing that everything can be restored. Fast, secure access to your information from your office or remote location in case of an emergency. Virtual solutions give you an edge over the competition. The Cloud and virtualization allows your staff to collaborate more strategically without spending more money on new technology or dealing with major changes that can cause productivity disruptions. 24/7 support and reliable technology is a must to allow you to focus on more strategic projects. Accurate, real-time tracking of your inventory improves your overall operations. 24/7 access to your inventory management software helps you avoid product shortages and results in optimized efficiency in production and order fulfilment. Access to all of your files and applications allows your team to look up orders, inventory, shipping details, and more instantly, allowing you to provide your customers with accurate information in real time. Provide the best customer service around with added speed, accuracy and efficiency. Constantly facing potential new security threats and breaches is a common concern for businesses today. To deal with complex and ever-changing threats, organizations need to understand potential threats so they can monitor for them and stop them before they happen. CyberlinkASP provides you with the constant monitoring required to keep your system safe from potential breaches.